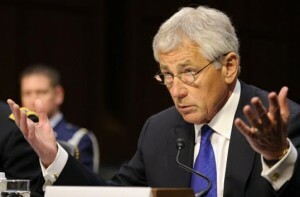 Before his appointment as U.S. Secretary of Defense, concerns existed that Chuck Hagel was a proponent of the massive cuts envisioned for the DoD as part of Sequestration. With his Statement on Strategic Choices and Management Review (SCMR) (31/07/13), the Secretary has made it very clear that he is no bedfellow of austerity. That is to say, even if we break the back of our armed forces, we still fall short of the required austerity. The original intent of Sequestration, as an “impossible scenario,” is unfortunately coming to pass – not in possibility but in functionality. The Secretary has not, through the SCMR’s response to Sequestration, put down a viable plan for the future. He has set down a warning of what is to come. Let us hope that warning is heeded. Interesting comments from SECDEF on Sequestration, since it was the President’s idea. SECDEF seems to think it is only Congress’ fault, which is wrong. Any attempt to detach DoD from the Sequestration deal will result in howls of protest from those who only agreed to the deal because of the defense cuts (largely those on the Left side of the spectrum). Based on the President’s recent economic speech and so-called “grand bargain” offer, it is obvious he is not serious about solving the issue either. We are just going to have to wait for a new President who can deal with Congress, or we can just return Congress back to Democrat control in 2014 (though the Democrats have shown no interest in resuming increased defense spending). However, given how the President and Congress ignored former Secretary Gates on the issue, it’s hard to see why they would take Secretary Hagel seriously.